Server virtualization has transformed corporate IT -- companies have enjoyed major cost savings and have gained flexibility and efficiency. But this has also led to a proliferation of virtual machines and servers that threaten to overwhelm data movement and storage technologies. 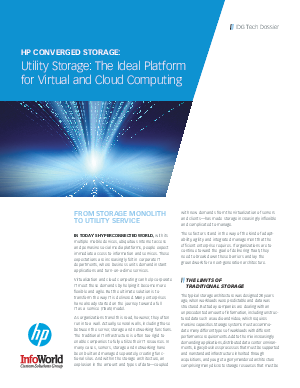 In this IDG Tech Dossier sponsored by HP and Intel®, learn how utility storage makes for massive consolidation, flexibility and scalability, so IT departments can reduce storage infrastructure and lower costs while improving their ability to respond to fast-changing needs of business units.